Wahama sophomore Hannah Rose tries to beat a force out throw at second base during Thursday night’s non-conference softball game against Buffalo in Hartford, W.Va.
HARTFORD, W.Va. — From good to bad in a short amount of time. 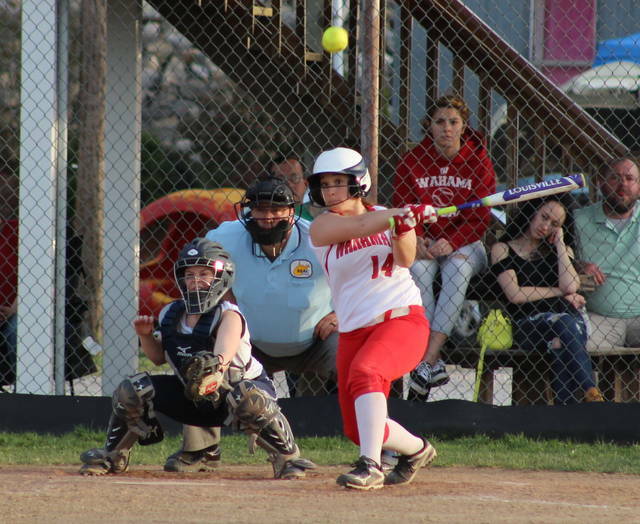 The Wahama softball team led 8-3 through four innings of play, but visiting Buffalo benefited from some miscues and scored the final eight runs en route to an 11-8 non-conference decision Thursday night in Mason County. The host Lady Falcons (7-4) led 4-1 after an inning and were ahead 6-3 through two complete, then tacked on a pair of scores in the home half of the fourth to claim their largest lead of the night headed into the fifth. 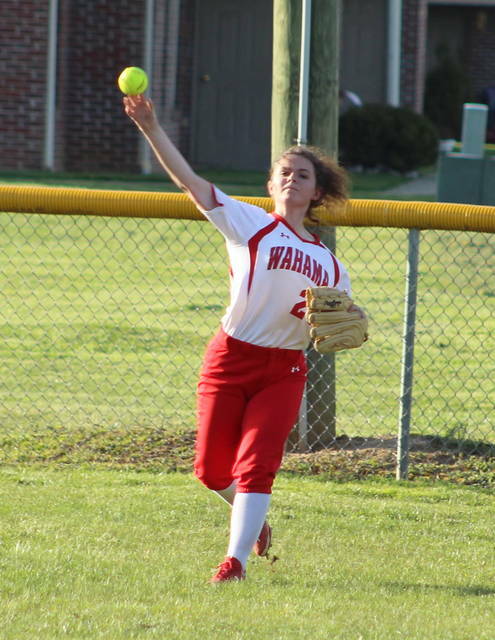 The Lady Bison (10-6) made their big charge in the top half of the fifth after sending nine batters to the plate, which resulted in five runs on four hits, two hit batters and an error — and one very big play that didn’t work in Wahama’s favor. With the bases loaded and one away, Lindsey Russell hit a ground ball to shortstop that turned into what appeared to be a sure-fire double play. After converting the force at second base and delivering a perfect relay throw, the ball was dropped at first base — allowing Cali Smith to score for an 8-4 contest. Two singles and a triple followed from there, leading to four runs and an eight-all contest midway through the fifth. 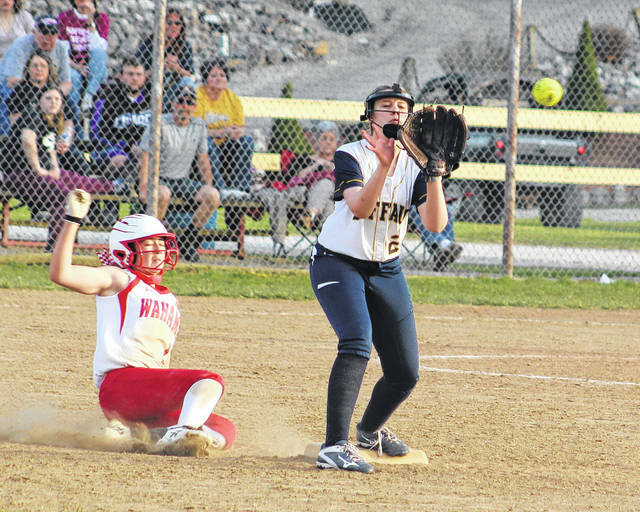 WHS managed only four baserunners — none of whom advanced past first base — over its final three frames at the plate, while the Blue and Gold just kept riding the momentum they had built in the fifth. Olivia Arthur started the top of the sixth with a leadoff double, then advanced to third on a ground out by Smith. Katlynn Rasake followed by reaching safely on an error that allowed Arthur to score the eventual game-winning run. Rasake moved to third on a second error and later scored on a wild pitch to make it a 10-8 contest after six full frames. Emily Reilly delivered a one-out single in the top of the seventh that allowed Maggie Bird to come home, wrapping up the three-run outcome. BHS outhit the Red and White by a slim 11-10 overall margin, but the guests also benefited from six Wahama errors in the contest. Buffalo, conversely, committed only two errors and left five on base, while the hosts stranded six on the bags. WHS coach Mike Wolfe was a bit dejected following the game, primarily because his offense did more than enough to make Thursday night winnable. It was the other half of the equation that had the second-year mentor frustrated. Buffalo took a 1-0 lead in the top of the first after a double-steal attempt allowed Rasake to score, but the Lady Falcons countered with four scores in their half of the first. Hannah Rose scored on an Emily VanMatre single, then Maddy VanMatre singled home Emily VanMatre for a 2-1 contest. Grace Haddox came in as a courtesy runner for Maddy VanMatre and advanced to third on a Victoria VanMatre single, putting runners at the corners. An error allowed Haddox to come home for a 3-1 lead, then Victoria VanMatre scored on a Hannah Billups single that gave WHS a 4-1 cushion after one complete. Smith delivered a two-out single in the second that plated Reilly, then an error also allowed Arthur to score on the play as the Lady Bison whittled the lead down to 4-3. Emily VanMatre knocked in Rose with a two-out triple in the bottom of the second, then scored on an error as the hosts extended their lead to 6-3. Emily VanMatre added another RBI in the fourth as a two-out single allowed Rose to score, then Emma Gibbs came home on a passed ball to increase the cushion to 8-3 through four full frames. Bird ended up being the winning pitcher of record after allowing zero runs, one hit and two walks over three innings of relief while striking out four. Billups took the loss after surrendering seven earned runs, 11 hits and three walks over seven frames while fanning two. Rose and Emily VanMatre led Wahama with three hits apiece, followed by Billups, Gibbs, Maddy VanMatre and Victoria VanMatre with a safety each. Emily and Maddy VanMatre both knocked in two RBIs as well. Smith, Bird and Reilly paced Buffalo with two hits apiece, followed by Rasake, Russell, Arthur, Brooke Slaubaugh and Haleigh Casto with a safety each. Bird and Reilly drove in two RBIs apiece and Rasake led the guests with three runs scored. Buffalo claimed a regular season sweep of the Lady Falcons after posting a 9-5 decision at BHS back on April 4.